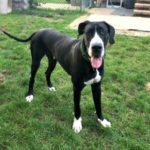 The Great Dane has a good disposition, often called a “gentle giant”. Charming and affectionate, they are playful and patient with children. They love everyone and need to be around people. The Great Dane does not bark much and only becomes aggressive when the circumstances require it. They are reliable, trustworthy and dependable. Courageous and loyal, they are good watchdogs. 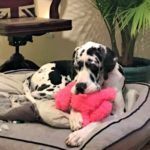 The Great Dane does not stay little for long and consistent training and rules should start right from puppyhood. This giant dog should be taught not to jump or lean on people. The objective in training this dog is to achieve a pack leader status. It is a natural instinct for a dog to have an order in their pack. When we humans live with dogs, we become their pack. The entire pack cooperates under a single leader. Lines are clearly defined. You and all other humans MUST be higher up in the order than the dog. That is the only way your relationship can be a success. Dogs who know their place below humans in the pack order will be good with children. If you are not a firm, confident, consistent pack leader who knows how to correct the dog when he is showing signs of aggression, the dog can be dog-aggressive. Owners who know how to properly handle their dogs will not have this issue. Prone to hip dysplasia, bloat, heart disease, tumors and tail injuries. Jogging is not recommended until the dog is at least one year old, but walking is necessary. Not a long lived breed. The average is under 10 years, however some can live to be 12-13 years old. 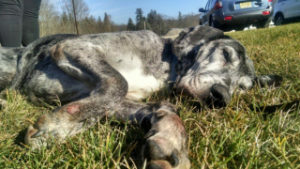 The Great Dane is a very old breed, known as the “Apollo of all dogs.”. Dogs resembling the Great Dane have appeared on Greek money dating back to 36 B.C. There are also drawling’s of these dogs on Egyptian monuments from roughly 3000 B.C. The earliest writings of dogs that sounded like Great Danes were in Chinese literature dating back to 1121 B.C. In 407 A.D. German Gaul and part of Italy and Spain were invaded by an Asiatic people (the Alans) who brought with them powerful mastiff-like dogs. They were admired for their ability to bring down bear and wild boar. The dogs were thought to have been Wolfhound mixed with the old English Mastiff. 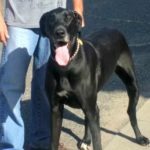 With selective breeding the Greyhound was added in to create the Great Dane. Besides being used as a hunter, they were also used as estate guard dogs. Despite the fact that they are called Danes in English, they have nothing to do with Denmark. The Great Dane was recognized in 1887. 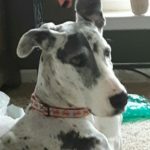 Some of the Great Dane’s talents are tracking, watchdog and carting.